Cantilevered canopy at main entry. 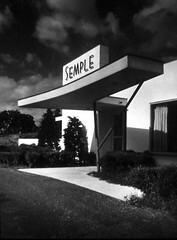 This building was designed by Harris Armstrong for Semple Industries in Ladue, Missouri. Fred Semple had a machine shop business and hired Armstrong many times over the years for his offices, shops, and home.